Atlanta, GA: Shanti – A Journey of Peace, the pioneering multimedia musical experience conceived composed and directed by Cincinnati based composer Kanniks Kannikeswaran enraptured a filled to the capacity auditorium at Robert Ferst Center at Georgia Tech on November 8. 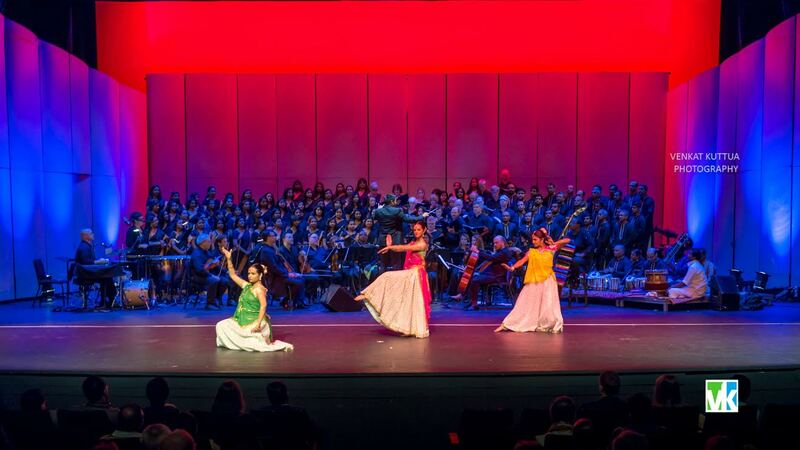 Shanti is in its 10th year of presentation and Atlanta was the chosen city for its tenth performance. The program brought together 200 talented participants from diverse cultures in Atlanta. This seemingly effortless and smooth flowing program encapsulating the evolution of a 5000-year-old civilization, started with an invocation to Ganga, a suite of six movements depicting the human mind’s enquiry into the very idea of existence. The second depiction, Faiths, was a suite in five movements outlining plurality of faiths linked through mystery. The third depiction, the boundless human spirit, traced the achievements of the human spirit in a state of internal peace. The fourth depiction,Ashanti, was a musical interpretation in three movements of the state of unrest or lack of peace. This was followed by Reflection a musical narrative of how the human spirit relates to existence and a vision of future and the celebration of the spirit of re-creation and rejuvenation, dance of creation. The finale was an expression of a vision for the future which offers nothing but peace and joy. This dance drama comes at a time when the world is torn apart with growing violence everywhere making it all the more appealing and apt. 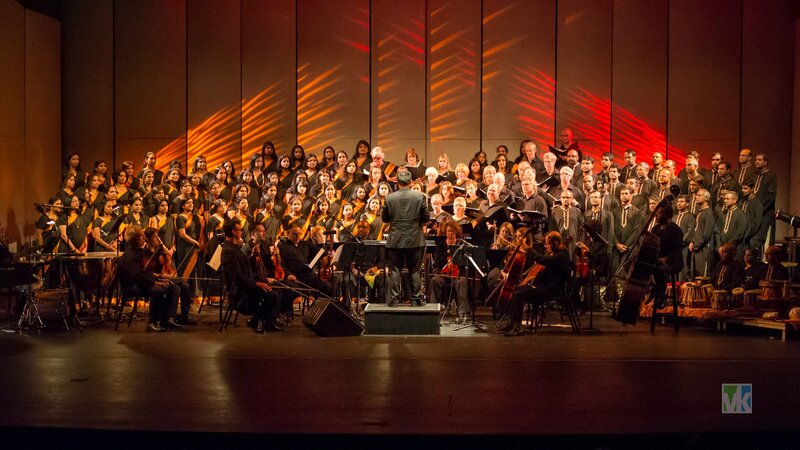 The program received a standing ovation from a mesmerized audience who were enthralled with the unique program that celebrated the bond of connectedness through music. The orchestra comprised of musicians from various symphony groups, faculties from major universities and singers from operas. The night felt truly uplifting. Earlier in the evening, the program opened to a brief introduction of Kannikeswaran, conductor Huu Mai and acknowledgment of several sponsors, institutions, departments and groups such as Raksha (Aparna Bhattacharya), Deloitte, and Veena & Ajay Madwesh who have been instrumental in making this show happen in Atlanta. IACA provided support along the way as well. Consul General of India in Atlanta, Ambassador Ajit Kumar, who was chief guest at the event, released the CD recording of ‘Sacred Choral Chants’. The program was a collective effort of several acclaimed personalities in the cultural genre such as Payal De (Odissi), Uma Murlidhar (Planet U Performing Arts), Sasiskala Penumarthi (Kuchipudi) Padmaja and Siddharth Kelam (Bharata Natyam,Kalaivani Dance Academy), Bhavini Rajan (Samarpanam School of Fine Arts), Gayatri Subramanian (KA Academy of Music and Dance) Kumud Sawla (Kathak, Nritya Natya Kala Bharathi) and Anupa Thakurta (Deeksha School of Performing Arts). The Atlanta performance of Shanti, like the other previous performances is a grassroots movement. Composer Kanniks Kannikeswaran has been traveling for several weekends to Atlanta to teach the music score of Shanti to the newly assembled group of singers. The singers varied in musical abilities and varied from trained professionals to casual singers. This group of 80 singers then rehearsed with a western choir at the Unitarian Universalist Church of Metropolitan Atlanta North in the weeks leading up to the performance under the baton of the conductor Huu Mai. “Watching the program take shape from its infancy to watching the final performance at close quarters was extremely fulfilling!” said Ajay Madwesh, who had sung earlier in Shanti in 2008. Kannikeswaran who also wrote the script, narration and musical score for Shanti, is a recent recipient of the prestigious McKnight Visiting Artist Fellowship (Minnesota) and the Ohio Heritage Fellowship. His projects are consistent with building community by emphasizing peaceful coexistence of diverse cultures through epic representation of 5000 year old cultural history of India via music, dance and visuals. The program’s choral and orchestral director Huu Mai is a concert pianist of the highest caliber and is also a well known conductor in the Atlanta area. Shanti touched, moved and inspired audiences and performers alike and left the audiences wanting for more. “It was wonderful to hear something that I composed 10 years ago come alive afresh in Atlanta after 10 years. I was overwhelmed by the energy of the performance and am very grateful to Atlanta for breathing life into this score’, said Kannikeswaran. “Each visit of mine to Atlanta to teach the music to the singers was a very special one. Shanti grew layer by layer and it all came together on Saturday the 8th. I was swallowing lumps in my throat as I heard the choir rehearse the finale – just a day before the show. The singers were great, the dancers were wonderful, the audience was wonderful – overall it was an unforgettable experience,” he added.